Low Carb – Slow Cook! That’s what we’ve got with this delicious meal made in the slow cooker! It’s low carb and cooked slow. The flavors are amazing and you might just find this to be your new favorite low carb. Your go-to low-carb meal! It’s made with chicken and a homemade combo of Ranch seasoning mix…plus cream cheese and cheese and bacon. Cook the bacon and chop it up into small pieces. In a small mixing bowl, combine the cream cheese, chopped bacon with the parsley, dill, garlic powder, onion powder, basil and pepper. Place the chicken breasts in the base of the slow cooker. Spread the cream cheese-bacon mixture over the chicken. Set on low and cook for 8 hours. Once cooked, strain off excess liquid if needed, then shred the chicken with the cream sauce. Mix in the shredded cheddar cheese. Season with salt and pepper to taste. 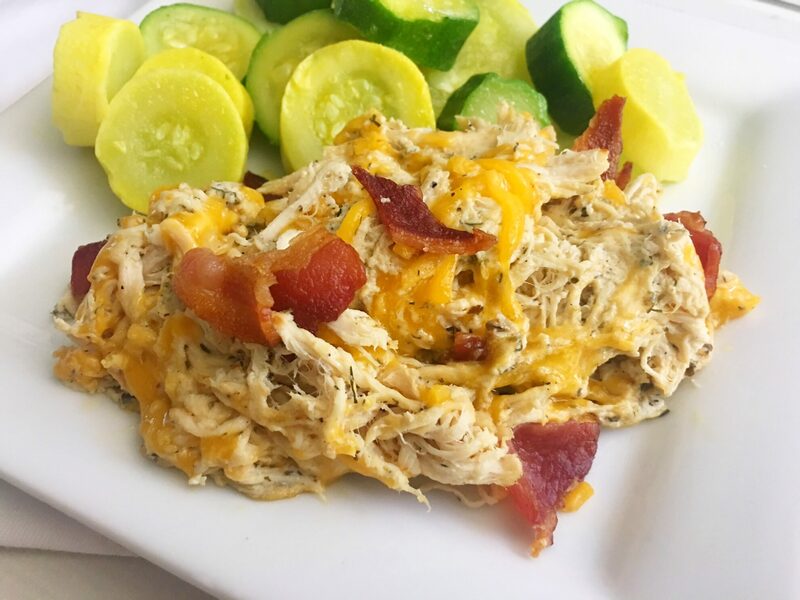 Serve Slow Cooker Bacon Ranch Chicken with veggies.